You may have recently heard a considerable amount of news with regards to the ongoing investigation into pet illnesses in North America with a possible direct relation to jerky treats that are manufactured in China. So far, most of this news has come from the United States, including a detailed response from the Federal Drug Administration on the matter. The FDA also released this Fact Sheet on Jerky Pet Treats to coincide with their autumn update. Has the same scenario been playing out here as well? 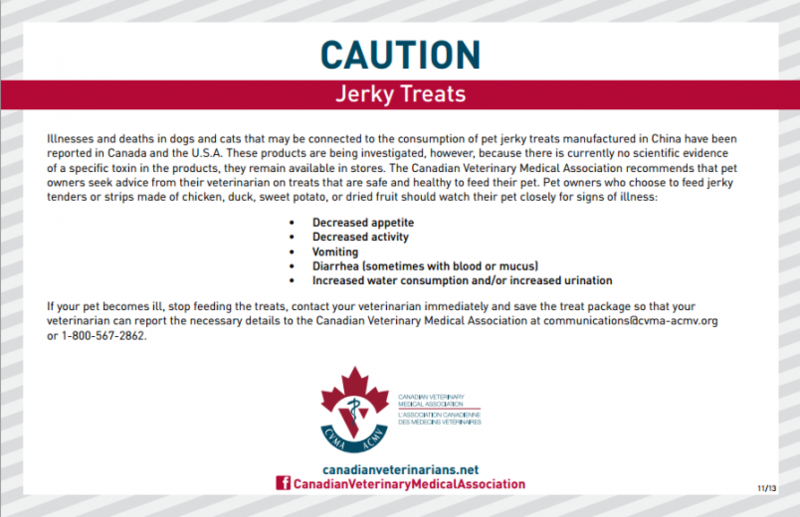 The Canadian Veterinary Medical Association, the national association and voice for the veterinary profession in Canada, has recently released an update on the Jerky Treat investigation as well as a caution to both vets and pet owners. Use these releases to educate yourself about what treats your pets are eating and whether they are ultimately healthy for consumption. The fact that they are still available for purchase in Canada indicates that buyers must be diligent. If you have any questions about these reports or about what are the best treats to offer your pet, contact your local veterinarian today.